Put a bucket under the tap or shower and turn the tap on fully for 20 seconds. Measure the water in the bucket (a one litre measure is best). The flow rate is the number of litres collected times 3. Hence, 9 litres collected in 20 seconds equals 27 litres per minute flow rate. A standard showerhead uses about 15 to 25 litres of water per minute – a three star rated water efficient showerhead uses as little as 6 or 7 litres per minute. Showers account for one third of the average Australian household’s annual water use: 66,000 litres. A water efficient showerhead can cut water use down from 25 litres to 9 litres or less. This brings the 120 litres of water used during an eight minute shower down to 72 litres – a 40% saving. A water efficient showerhead saves a household around 14,500 litres of water per year. While a typical tap discharges 15 to 18 litres per minute (some can reach 30 litres), low flow or aerator taps may use as little as 2 litres per minute. Fixing drips is a must, as a dropping tap can waste more than 200 litres per day. Look for 3 star ratings when you are buying taps. Toilets account for about 15 percent of household water use. Building requirements in virtually every part of Australia now require the fitting of dual-flush toilets. Dual flush toilets allow users to choose to use only half the water in the cistern. Toilets now come with an efficiency rating (look for toilets with 6/3 dual flush with at least a 3 start rating, as some use 9 litres or 4.5 litres). 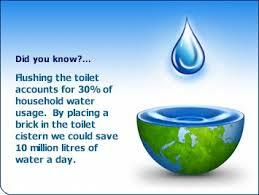 The old-style automatically flushing urinal can add hugely to a water bill – averaging around 2.2 litres per flush. The most efficient urinals reduce flush volumes by around 30%. The combination of low flush capability with sensor operated flushing, may mean that water savings approach 40% to 50%. This entry was posted in Efficient Buildings, Smart house and tagged save life, save water, water conservation, water efficiency. Bookmark the permalink.